Reality isn’t that simple. If you NEED a stylus to operate a device, you have “blown it.” That said, there are situations where you need more finite control on a writing surface than just your finger. Both Samsung (on earlier, non-exploding Note models of phones and tablets) and Microsoft (Surface devices) have capitalized on that ability. There are times a stylus is wonderful, and in music, we have a lot of those moments. For example, if your digital music reader can accept written input, a stylus is usually far better than a finger. Another example is writing notation (or diacritical markings) with NotateMe or Notion in iOS. Apple understood this–they were not handcuffed by Steve Jobs’ earlier pronouncement about styluses. When the iPad Pro 12.9″ device came out, the Pencil came along with it–and other than criticism for being glossy and rolling away too easily, it is generally accepted as the finest non-Wacom tool on the market for any stylus device. If you own an older iPad (as I do), or any other device than an iPad Pro (phones, Android phones, Android Tablets), you cannot use the Apple Pencil. It does not register on a non-iPad Pro. I searched for the right stylus for years. I originally liked the Cosmonaut, a large white-board marker type stylus. I later fell in love with the Maglus, followed by styluses with Fiber Mesh tips, and finally I fell in love the Adonit Jot Pro. I have an entire drawer full of discarded styluses (styli?). The problem with Stylus input is that a touch device is looking for the capacitve touch of a finger, with a minimum circular area of 4mm. A stylus somehow has to mimic a larger area while giving the user a finer “tip” than their own finger. About a year ago, Adonit introduced the Jot Dash, a pen-like stylus that didn’t need a Bluetooth connection or to have specific apps running Adonit’s developer’s kit for the stylus to work. It is battery powered, and when turned on, the Jot Dash creates an electrical capacitive touch from a very small pen-like tip. I have used the Jot Dash since Christmas last year, and it has been the best stylus experience of my 8 years of iOS device use. It is a $50 stylus, and it doesn’t work as well as Apple’s Pencil ($99)–but it far outperforms any other stylus I have ever owned. About two weeks ago, Adonit announced two new styluses. The first is a new version of the Jot Dash, and the other is a thin and flat stylus called the Adonit Snap. The Snap was immediately appealing for three reasons. First, the Snap charges with an embedded micro USB connection. The Jot Dash requires a separate magnetic USB charger–and I have lost track of that charger a number of times. Second, I liked the shape of the Snap, as it was reminiscent of the Maglus Sylus, which was shaped like a drafting pencil. A drafting pencil allows you to hold it like pencil or a marker–which was very functional and something that appealed to me. Third, the Snap has a button that is intended to act as a bluetooth shutter for a cell phone. As an added benefit beyond those three things, the Snap is roughly $10 cheaper than the Jot Dash and it has an embedded magnetic mount to help hold it to a device. I ordered a Snap, and the it arrived last week. After a week of use, I wish the Snap was a little thicker. It is almost too narrow (and slippery) to hold comfortably. The dimensions of the Snap are purposeful…it is meant to be a small stylus to carry with a cell phone. Even so, I would prefer a bit more meat on its bones. The Snap\ is also shorter than the Jot Dash…and I would have made the Snap just as long. It isn’t too short for writing…but it could have been just a little longer in terms of feeling more like a writing tool. In use, the Snap functions the same as the Jot Dash. Something is strange with the iPad Air 2 (my current iPad) where the tip of the Jot Dash or the Adonit Snap draws a diagonal line as “wavy” if you go slow (I do not believe this happens on any other device). The Snap beats the Jot Dash in that it charges in device with a needed USB adapter…and that fact alone may make it worth the purchase. So…if you need a stylus and don’t have an iPad Pro…consider either of these two styluses. The Jot Dash 2 feels better to hold, the Adonit Snap is just more convenient to use without having to worry about the location of a charger. I have had the Apple leather case on my iPhone 6 since I purchased it this past fall. This has been a big change for me, as I was used to having a Pad & Quill wallet case for my iPhone 5. It may seem awkward to have your phone connected to your wallet, but in my experience, the less number of things I have to carry in my pocket, the better. I chose to not purchase the Pad & Quill Little Pocket Book case for my iPhone 6. My previous P&Q case didn't hold up to my use of the wallet/case, with the liner ripping that kept the credit cards apart. I also had a problem with the elastic band that held the case closed…that cord eventually stretched out, and I eventually had to cut it off. I never had any issues with the wood frame of my iPhone 5 P&Q case, as I did with an iPad P&Q case, so the P&Q did keep my iPhone 5 safe from damage over the two years I owned it. 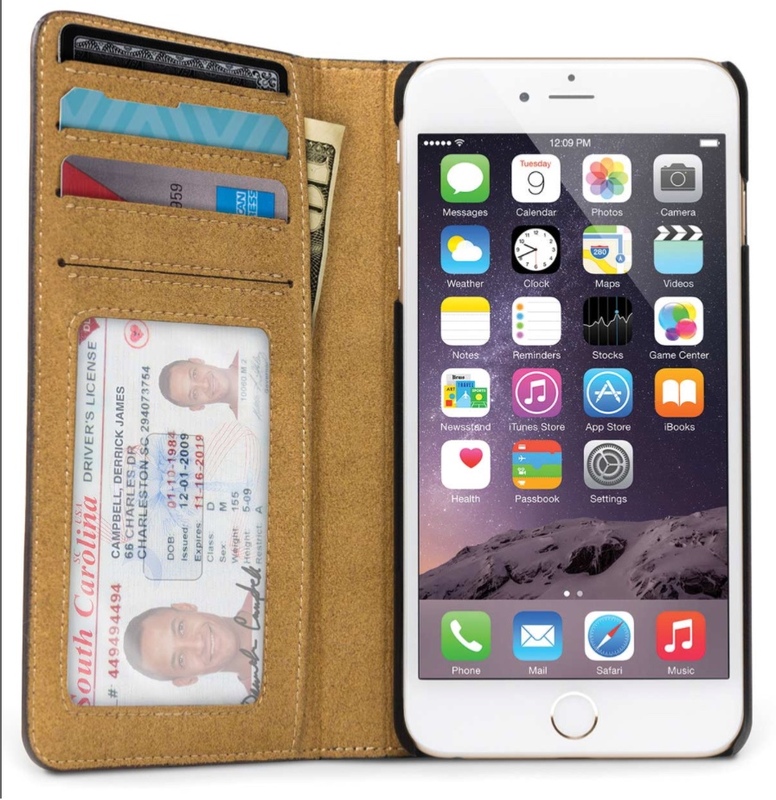 About a month ago, Twelve South announced its Book Book wallet case for the iPhone 6 (and six plus). I ordered it as a Christmas gift for myself. Although I like the plain styling of the P&Q case versus the true “book” look of the Twelve South case, the Twelve South case had one specific feature that I loved–the ability to remove the inner plastic case (which looks very much like my Apple leather case for iPhone 6). There are rare times I don't want my full wallet/phone. At those times, however, I don't want to lose protection on my phone. So, the Twelve South Book Book seems like an ideal case. The inner case is connected with little plastic “hooks” to the leather case. I need to see how these hooks hold up over time, and how Twelve South will respond if there are issues. But for now, I am very happy to have one item in my pocket, rather than two in separate pockets. Don't get me wrong…I still like P&Q products, and had Twelve South not created a case with a removable inner case, I would have bought another P&Q–but I would have been easier on the credit card spaces (in my old P&Q, I would put 2 cards in the same slot from time to time, which is why I never contacted the company about the issue). I am looking forward to using this new Twelve South case, and I will offer further thoughts on the case down the road.